How to properly divide your hostas. Watch Richard Merritt of New Hampshire Hostas as he shows you step-by-step how to propagate your hostas. Richard talks about the best time of year to transplant hostas, the tools to use and the soil and type of compost he uses at New Hampshire Hostas. There are two ideal times to divide your hosta: Spring and Fall. There is reduced demand by the foliage for water. There is usually more moisture available than during summer. Inevitably, when you divide plants, you are losing some of the root system. Spring division is about a four week window. Once the hosta eyes are popping up and before they have begun to unfurl is the window of opportunity to make your move. Fall division is also an approximately four week window. In the northern climates this is going to be the month of September and, as you go south, that window for dividing hostas moves later into October. Cool moist weather is what you want. Make your decision based on the long range weather forecasts. 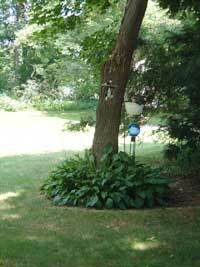 Generally, lifting and dividing hostas is setting them back several years in maturity. How far you set them back depends on how much root system is lost in the process. So, the question that you should be asking yourself before you proceed to divide your hostas is this: How many plants do you need and how far back in maturity are you willing to set them? Why Are You Dividing Your Hostas? Why do you divide hosta? I bring this up because I get the sense from some customers that they divide them too often. Hosta Plants Only Improve With Age When They Are In The Right Location. 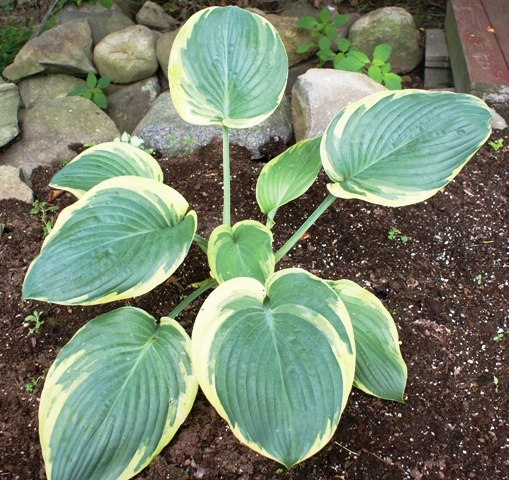 Some of the giant or jumbo hosta cultivars do not reach maturity for five years and they continue to improve in appearance as the overall clump expands. 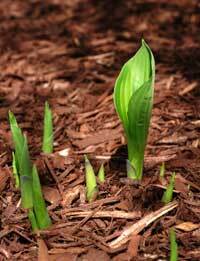 Hostas may reach a space limit and slow down in growth, but they rarely decline from space constriction. If they are in decline, it is more likely a poor site for that cultivar. They should be relocated to a more suitable location. If you want more plants of a particular hosta cultivar to meet your garden design needs, there are several ways to do this. One thing that I frequently do is lift a clump and divide it into quarters or thirds. I then reset it in the same location with a slightly wider spacing. It provides me with a larger appearance of this hosta and, by summer, you are not able to tell it was divided. If you are looking to give a friend a piece of your favorite hosta plant, you can often times cut off one of the outermost eyes without disturbing the primary clump. If the soil is not moist from rainfall, it's helpful to water the day before you're going to divide your hostas. Remember that the fewer roots you cut off the better the transplant is going to go. Depending on the size of the clump, sink your spade into the ground all the way around the clump far enough away to not be cutting off much root. Depth may be 8 inches or eighteen inches depending on the cultivar of hosta. From one or more sides, cut under the clump and pry it out of the hole. I like to set a tarp on the ground near by to place the clump on. This provides for an easy clean up after dividing clumps. Assuming that you have lifted a fairly substantial clump of, say, 30 eyes, you can approach it in several ways. If you halve, third or quarter a large clump, you can do this without setting your hosta back hardly at all. Place the hosta on a board for a firm surface. Using a straight spade, make your cuts. Try to slice as few eyes as possible. If you have the patience, you can gradually shake off soil and eventually either pull the clump apart or get a heavy knife into the clump and not lose any hosta eyes. Certain cultivars pull apart easier than others, but most need to be cut. So, do you cut a clump of 30 eyes into 3 pieces or 30? To each their own according to their needs. If you are cutting hosta into individual eyes, I use old kitchen knives. If you are halving or quartering, I use a heavy straight spade. When you are resetting your hosta plant divisions, they should be the same depth that they were prior to division. This is the ideal time to enrich your soil with ample amounts of compost - and don't forget to soak them after planting. This will help to eliminate air pockets as well as insure that the now reduced root system is in contact with moisture.